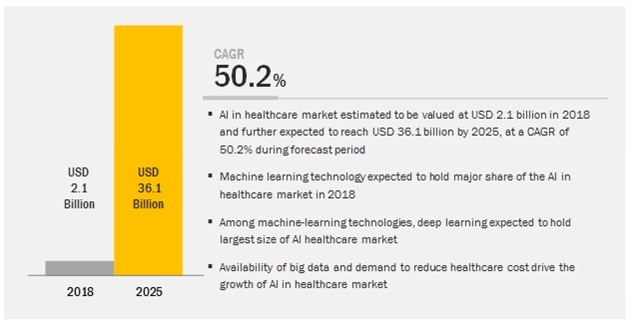 [216 Pages Report] The AI in healthcare market is expected to grow from USD 2.1 billion in 2018 to USD 36.1 billion by 2025, at a CAGR of 50.2% during the forecast period. The huge availability of big data, growing number of cross-industry partnerships and collaborations is fueling the growth of the AI market. In addition, demand to reduce the imbalance between healthcare workforce and patients is further supplementing the growth of the AI in healthcare market. Increasing need for hardware platforms with high computing power to run various AI software is the key factor accelerating the growth for hardware devices in the AI in healthcare market. Demand for high-computing processors to run AI algorithms continues to surge its growth in the hardware segment. The processor segment consists of MPUs, GPUs, FPGAs, and ASICs. In processors, GPUs are expected to foresee strong growth owing to high parallel computing capabilities, and the same is expected to continue in the coming years. The development of more sophisticated hard and soft sensors has accelerated the growth of context-aware processing. Increased processing power, innovative sensing capabilities, and improved connectivity have resulted in the growth of context-aware processing systems. A few core healthcare applications include lifestyle management and monitoring, in-patient care and hospital management, and virtual assistant. AI in planning and scheduling methods can offer substantial support to the management of hospitals and patient care, thereby improving administrative workflow assistance. AI-enabled bots is an AI application that patients can interact with through a chat window on a website or through a telephone. Applications such as scheduling appointments; checking insurance coverage parameters; instantly accessing information about drug interactions and side effects; collecting the latest information about patient medications, care team, and recent procedures; designing special diet plans for patients with dietary restrictions; and engaging with discharged patients to follow up on treatment plans and adherence are supported by these bots. These applications are expected to lead the growth of in-patient care and hospital management systems. North America, being a developed and technologically advanced region, is likely to be one of the key contributors to the overall AI in healthcare market growth during the forecast period. Moreover, high spending of GDP in healthcare, especially in the US and Canada, is likely to supplement the growth of next-gen technologies such as AI in the region. 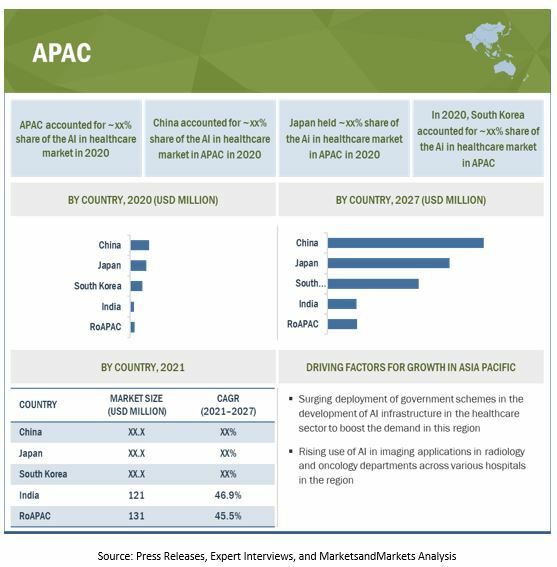 APAC is likely to closely pursuit the growth of North America and is expected to register the second-fastest growth rate. Improving IT infrastructure, demand for affordable healthcare, and favorable government norms are expected to boost the growth of healthcare AI in the region. A few companies in the AI in healthcare market are NVIDIA (US), Intel (US), IBM (US), Google (US), Microsoft (US), AWS (US), General Vision (US), GE Healthcare (US), Siemens Healthineers (Germany), Medtronic (US). The market has active participation of start-ups. A few emerging start-ups in the market are CloudMedx (US), Imagia Cybernetics (Canada), Precision Health AI (US), and Cloud Pharmaceuticals (US). IBM is among the leading companies in the AI in healthcare market. The company’s Watson is widely used by end users for cognitive computing and data-driven applications. IBM follows organic as well as inorganic growth strategies to improve its position in AI in healthcare and other emerging AI markets. The company has invested ~USD 6 billion to make 15 acquisitions in cognitive, cloud, and security businesses. Also, partnerships/collaborations with AI solution providers/consumers remain the important aspects of the company’s strategy to enhance its footprint in the AI market. The company continues to strengthen its position through strategic organic investments and acquisitions in higher value areas, broadening its industry expertise and integrating AI into more of what the company offers. Moreover, the company focuses on developing core AI products, especially for enterprises and large businesses-e.g., the launch of Power Systems Servers to deliver AI services for enterprises in December 2017. In June 2018, Medtronic and its strategic technology partner, IBM (US) Watson Health, announced the commercial launch of Sugar.IQ smart diabetes assistant, a first-of-its-kind intelligent app designed to simplify and improve daily diabetes management. The Sugar.IQ smart diabetes assistant leverages AI and analytic technologies from IBM Watson Health to continually analyze how an individual's glucose level responds to food intake, insulin dosages, daily routines, and other factors, such as information provided by the app user. In July 2018, Micron and Intel announced an update to their 3D XPoint joint development partnership, which has resulted in the development of an entirely new class of nonvolatile memory with dramatically lower latency and exponentially greater endurance than NAND memory. The companies have agreed to complete joint development for the second generation of 3D XPoint technology, which is expected to occur in the first half of 2019. The 2 companies will continue to manufacture memory based on 3D XPoint technology at the Intel-Micron Flash Technologies (IMFT) facility in Lehi, Utah. In July 2018, ResMed (US), a global leader in sleep apnea treatment and connected health solutions, and Verily announced their agreement to form a new joint venture. Combining ResMed’s expertise in sleep apnea and Verily’s advanced health data analytics technologies, the US-based joint venture will study the health and financial impacts of undiagnosed and untreated sleep apnea, and develop software solutions that enable healthcare providers to more efficiently identify, diagnose, treat, and manage individuals with sleep apnea and other breathing-related sleep disorders. Which are the major applications of AI in healthcare market? How big is the opportunity for their growth in the developing economies in the next 5 years? Which are the major companies in the AI in healthcare market? What are their major strategies to strengthen their market presence? Which AI technology will find its major application in healthcare? Which are the leading countries in the AI in healthcare market? What would be the share of North America and Europe in this market in the next 5 years? What will be the role of the standards and regulations by governments and associations in the adoption of AI in healthcare? The study involved 4 major activities in estimating the current size of the AI in healthcare market. Exhaustive secondary research has been conducted to collect information about the market, the peer market, and the parent market. Validating findings, assumptions, and sizing with industry experts across the value chain through primary research has been the next step. Both, top-down and bottom-up approaches have been employed to estimate the complete market size. In the subsequent steps, market breakdown and data triangulation methods have been used to estimate the market size of segments and subsegments. 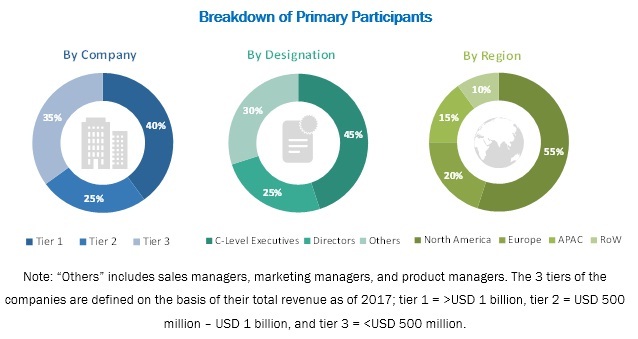 The research methodology used to estimate and forecast the AI in healthcare market begins with capturing data on revenues of the key vendors in the market through secondary research. This study involves the use of extensive secondary sources, directories, and databases such as Hoovers, Bloomberg Businessweek, Factiva, and OneSource to identify and collect information useful for the technical and commercial study of the AI in healthcare market. Moreover, secondary sources include annual reports, press releases, and investor presentations of companies; white papers, certified publications, and articles from recognized authors; directories; and databases. Secondary research has been mainly done to obtain key information about the industry’s supply chain, the market’s value chain, the total pool of key players, market classification and segmentation according to industry trends, geographic markets, and key developments from both market- and technology-oriented perspectives. In the primary research process, various primary sources from both supply and demand sides were interviewed to obtain the qualitative and quantitative information relevant to AI in healthcare market. Primary sources from the supply side include experts such as CEOs, vice presidents, marketing directors, technology and innovation directors, application developers, application users, and related executives from various key companies and organizations operating in the ecosystem of the AI in healthcare market. This report categorizes the AI in healthcare market based on offering, technology, end-use application, end user, and region.